zarinahtakesapaycut: Errol Oh, you are a good journalist, BUT this time, you have let all Malaysians down. Errol Oh, you are a good journalist, BUT this time, you have let all Malaysians down. You had a golden opportunity to ask Nik Hasyudeen of the Audit Oversight Board (AOB) some burning questions, but in this instance you had set aside objectivity and let the opportunity slip away. Firstly, there was no lawful mechanism for the AOB to have given out the forms and applications before the 1st of April, 2010. 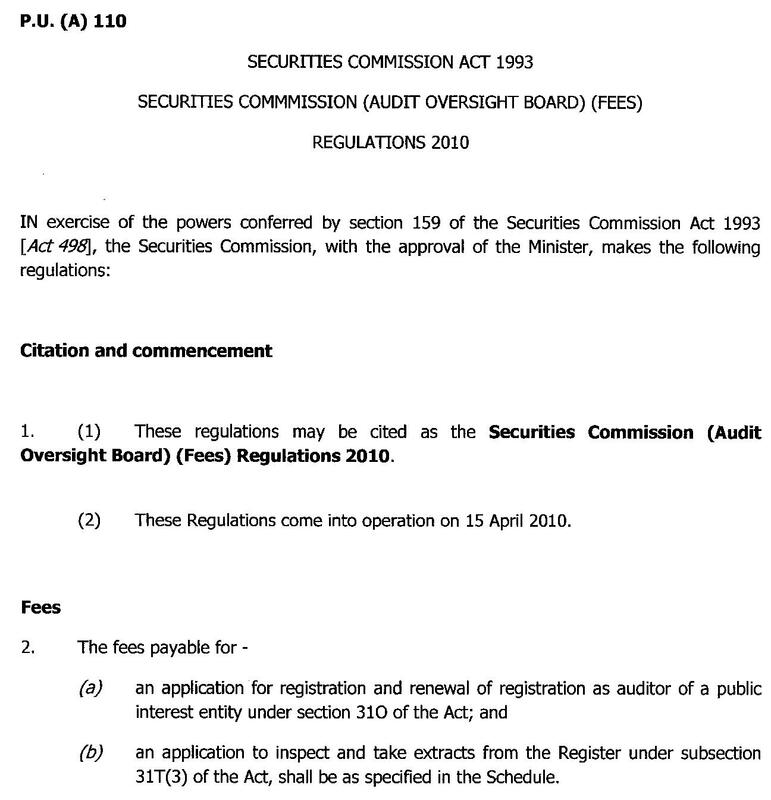 As the Securities Commission states in its website,"The Audit Oversight Board (AOB) is established under Part IIIA of the Securities Commission Act 1993. Part IIIA was incorporated into the Securities Commission Act 1993 by virtue of the Securities Commission Amendment Act 2010 (the Act). The Act shall come into force on 1 April 2010. " 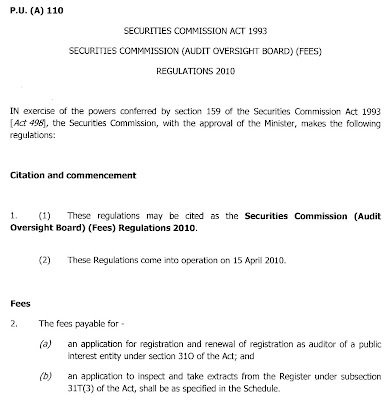 Furthermore, the Audit Oversight Board Handbook for Registration itself states, First Issued On : 1 April 2010. 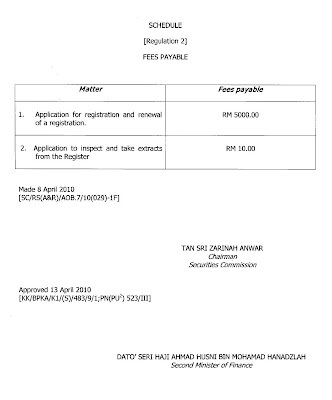 How could the AOB and Nik Hasyudeen have made the preparations before the 1st of April when the Oversight Board had not even come into existence, and he was not even appointed yet? Are we dealing with time travel here? Secondly, the law that allows for the AOB to collect the fees for registration only came into force on the 15th of April, 2010, so how could the AOB have collected any fees and approved any registrations before the 15th of April, even if they were able to conclude any and all inspections and necessary checks? How can we blame the FDI for drying up when even the regulators in this country do not follow the law! Mr Gunasegaram, just 3 days ago you asked some burning questions (your own words) of Petronas. Mr Errol Oh, you did the same on the function of PDP's, raising the question to Gamuda, MMC and others. But why was this objectivity set aside in the interview with Nik Hasyudeen and the AOB? Is The Star now doing a repair job for the AOB, seeing how the AOB had botched up on their very first day at the office? Is The Star's job now to paint the AOB with a new brush? If you believe you are doing anyone any favours by setting aside your objectivity, then you are wrong. Why are you putting your credibility on the line for the AOB's mess up? Or do you believe that you can do whatever you wish as a newspaper because you have a near monopoly, and the readers have no choice but to accept any spins that the paper wishes to put out? Mr Gunasegaram, as the MD of Starbiz, if you are called by any of your counterparts from Reuters or Bloomberg on the two questions you shielded the AOB from, how would you answer them? In 2004, Abdullah Badawi led the BN to a landslide victory as the Malaysians were willing to buy whatever Badawi was selling at that time. This is 2011, and the world is a different place now. Why have you let all Malaysians down by setting aside your objectivity as journalists? Look at Benghazi, and try to capture just a little of the spirit that now liberates that city. Become free, embrace objectivity once again, and stop playing to the tune of your part time masters. You have a duty to all Malaysians, and that duty exceeds all others. BTW, are you the same Errol Oh we remember playing hockey with a long time ago?